Five years ago, when Evo Morales was a rising political star as a congressman and coca farmer, I met him in his office in Cochabamba, Bolivia. He was drinking orange juice and sifting through the morning newspapers when I asked him about a meeting he just had with Brazilian President Lula. 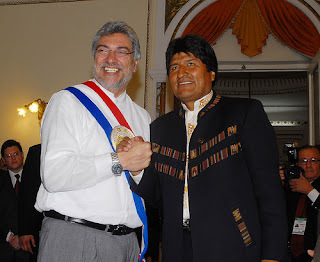 “The main issue that we spoke about was how we can construct a political instrument of liberation and unity for Latin America,” Morales told me. Now President Morales is one of many left-leaning South American leaders playing that instrument. This unified bloc is effectively replacing Washington’s presence in the region, from military training grounds to diplomatic meetings. In varying degrees, Argentina, Bolivia, Brazil, Chile, Ecuador, Paraguay, and Venezuela are demonstrating that the days of U.S.-backed coups, gunship diplomacy, and Chicago Boys’ neoliberalism may very well be over for South America. The election of Barack Obama also gave hope for a less cowboy approach from Washington. While many of the current left-of-center leaders in Latin America were elected on anti-imperialist and anti-neoliberal platforms, the general scope of their policies varies widely. 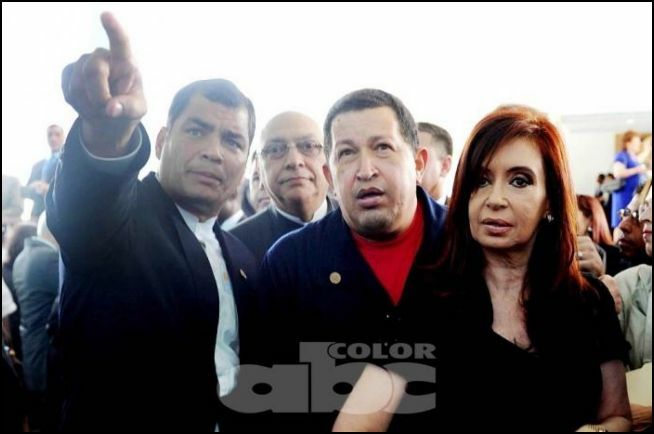 On the left side of the spectrum sit Hugo Chávez of Venezuela, Evo Morales of Bolivia, and Rafael Correa of Ecuador. They have focused on nationalizing natural resources and redistributing the subsequent wealth to social programs to benefit the countries’ poor majorities. They have also enacted constitutional changes aimed at redistributing land and increasing popular participation in government policy, decision-making, and budgeting. Chávez, Morales, and Correa were also more outspoken than other leaders in their critique of the Bush Administration. Lula, Michelle Bachelet of Chile, and Nestor and Cristina Kirchner of Argentina have been more moderate in their approach toward confronting neoliberalism, but have been trailblazers in human rights and in their dealings with the International Monetary Fund, World Bank, and World Trade Organization. Though they haven’t been as radical in their economic and social policies, they have shown solidarity with Venezuela, Bolivia, and Ecuador. A conflict in Bolivia this past September proved to be a litmus test for the new regional unity. Just weeks after a recall vote invigorated Morales with 67 percent support across the country, a small group of thugs hired by the rightwing opposition led a wave of violence against Morales’s supporters. The worst of these days of road blockades, protests, and racist attacks took place on September 11 in the tropical state of Pando. A private militia allegedly funded by the rightwing governor, Leopoldo Fernández, fired on a thousand unarmed pro-Morales men, women, and children marching toward the state’s capital. The attack left dozens dead and wounded. Just before this violence hit a boiling point, Morales kicked U.S. Ambassador to Bolivia Philip Goldberg out of the country, accusing him of supporting the rightwing opposition. Morales said of Goldberg, “He is conspiring against democracy and seeking the division of Bolivia.” Numerous interviews and declassified documents prove that the U.S. Embassy has supported the Bolivian opposition. Goldberg denies these charges. At a protest in which effigies of opposition governors and American flags were burned, Edgar Patana, the leader of the Regional Workers’ Center of Bolivia, spoke to reporters of Morales’s decision to kick out Goldberg: “If he hadn’t expelled him we would be tearing down the U.S. Embassy today.” Chávez followed Morales’s lead and kicked out the U.S. ambassador in that country. The Bush Administration responded by ejecting both nations’ ambassadors from Washington. When Morales arrived at a meeting of the Union of South American Nations (UNASUR) in Santiago, Chile, following the conflict, he condemned the rightwing violence in his country as part of a “civic coup d’état.” UNASUR is the most recent, and perhaps most effective, new coalition of South American nations. It emerged in its present form in 2007 to ensure, among other things, sovereignty, peace, and solidarity in the region. At the emergency meeting held to resolve the Bolivian conflict, the region’s presidents unanimously backed Morales, condemned the opposition’s violent tactics, and emphasized that they wouldn’t recognize the separatists. At the gathering, Bachelet took the leaders on a tour of the government palace, into the room where former president Salvador Allende committed suicide when a U.S.-backed coup against him took place in 1973. “The message was clear that this wasn’t going to happen, that a democratically elected leader won’t be forced from power in a violent coup while the rest of the region’s leaders watch,” says Laura Carlsen, a longtime Latin American political analyst and director of the Americas Program in Mexico City. On September 16, just days after the U.S. ambassador was expelled from Bolivia, the Bush Administration announced that Bolivia had “failed demonstrably during the previous twelve months” to meet its “obligations under international counternarcotics agreements.” On September 26, the Bush Administration made clear its plans to cancel Bolivia’s participation in the Andean Trade Promotion and Drug Eradication Act because of its failure in counternarcotics efforts. The canceling of this trade act is expected to result in the unemployment of some 20,000 Bolivians. Ironically, many of these recently unemployment workers will now likely seek work in coca production as a way to make ends meet. “As Bolivia’s South American neighbors rallied in support of the Morales government at a crucial moment, the Bush Administration devoted its attention to castigating Bolivia for expelling the U.S. ambassador—and ‘decertification’ was the nearest weapon at hand,” says a report from the Andean Information Network, a drug policy and human rights organization based in Cochabamba. Morales responded by expelling the U.S. Drug Enforcement Agency from the Chapare, a major coca-producing region in the country, and announcing plans to bolster trade with Venezuela to make up for the loss of the trade deal. Other events over the past three years signal a shift away from Washington. The failure of neoliberalism in South America, and the subsequent rise of the new Latin American left, was clear at President George W. Bush’s arrival at a regional summit for the Organization of American States in Mar de Plata, Argentina, in 2005, where soccer legend Diego Maradona told reporters, “I’m proud as an Argentine to repudiate the presence of this human trash, George Bush.” The massive protests that greeted Bush were a physical manifestation of public sentiment bubbling under the surface of street protests and economic ministries across the hemisphere: that the Free Trade Area of the Americas, a plan promoted ardently by the Bush Administration, to extend NAFTA-style trade policy throughout the entire region, was dead. In October of 2007, Ecuador’s Correa announced that his administration would not renew Washington’s lease on a U.S. airbase in Manta, Ecuador, unless Washington allowed Ecuador to open a military base in Miami (the U.S. refused). In March of 2008, when the Colombian military conducted a cross-border bombing into a camp of the guerrilla group Revolutionary Armed Forces of Colombia in Ecuador, U.S. diplomats said Colombia was justified and should operate with flexibility in its “war on terrorism” across borders. But regional leaders condemned Colombia’s actions and solved the tense conflict diplomatically without U.S. involvement. Last April, the U.S. Navy announced it would revive its Fourth Fleet in the Caribbean. Venezuela responded in September by announcing joint naval exercises with Russia in the same area. Venezuela and Brazil are also leading plans to develop a NATO-like South American Defense Council. “I once said that if NATO exists—the North Atlantic Treaty Organization—why couldn’t SATO exist? 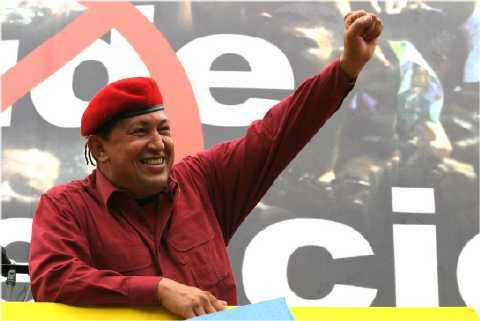 The South Atlantic Treaty Organization,” Chávez said in a speech. Then in Brazil in December, thirty-one Latin American and Caribbean leaders welcomed Cuba to the Summit of the Americas, which pointedly excluded Washington. “Cuba returns to where it always belonged,” said Chávez. “We’re complete.” For good measure, participants at the summit roundly denounced the U.S. embargo of Cuba. The U.S. is also losing influence in Latin America due to the decline of the International Monetary Fund (IMF), an institution through which the U.S. wielded significant power. The Bank of the South is a lending institution first advocated by Chávez, and now embraced by seven South American nations as a substitute for institutions such as the IMF and World Bank. Other agreements involving trade with each other are in the works. And some South American nations, particularly Venezuela and Bolivia, are looking to Russia and China—rather than the U.S.—for new trade and military deals. According to the Associated Press, China’s trade with Latin America jumped from $10 billion in 2000 to $102.6 billion in 2007. Recently, Bolivia signed a deal with Russia to purchase five new defense helicopters, and Venezuela announced plans to buy Russian tanks and reconnaissance vehicles. Meanwhile, Brazil inked an $11 billion deal with France in December for military items. Benjamin Dangl is the author of “The Price of Fire: Resource Wars and Social Movements in Bolivia” (AK Press). He is the recipient of two Project Censored awards for his reporting from Latin America.